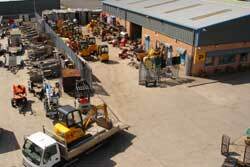 Providing tool and plant hire from Livingston, West Lothian, Scotland. Please browse our product range using the menu on the left. Our main business comprises of supplying and hiring small plant, tool and equipment to construction, industry and commerce. The business has also developed and diversified in sales of machine tools, a wide range of consumables, safety wear and safety equipment. And to this end we have a purpose built facility to promote this. We are sure you will be impressed by our commitment and style in serving our customers. Disc Cutter (Stihl Saw) Petrol 12"
Light duty breakers available from £24 per week.